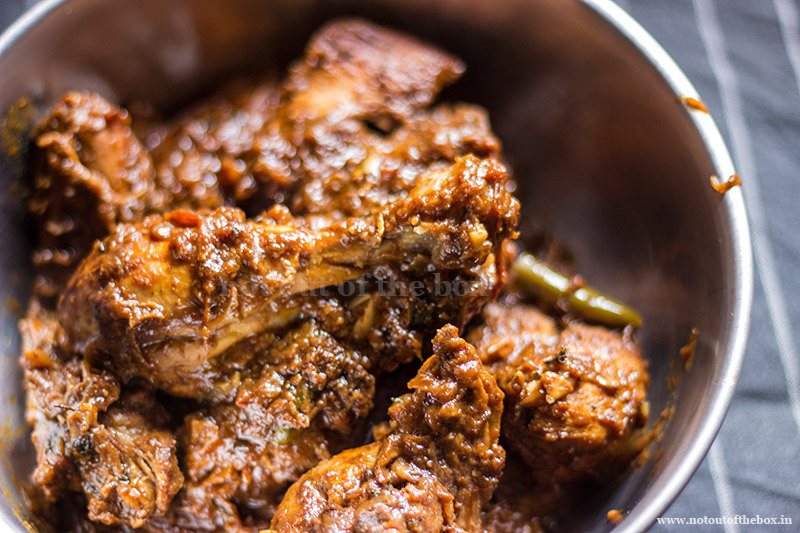 Chicken Kosha is an age-old Bengali way of cooking Chicken Curry. Like Kosha Mangsho this one is also high on spice level and not for faint-hearted. Wash chicken pieces, keep them in a plastic colander. This straining process removes the excess water from chicken. Peel the potatoes. Cut them horizontally into equal halves, wash and keep aside. Heat 4 tbsp oil in a deep frying pan/kadai. Add half amount of thinly sliced onions with a pinch of salt (adding a pinch of salt speeds up the browning process). Using a spatula, fry the onions continuously over medium heat. Add the whole garlic cloves in between. Mix and keep frying until all the onion slices have reached a dark, rich brown colour. Remove from the pan and keep aside to cool. In a large bowl marinate the chicken pieces with fried onion-garlic, kashmiri mirch powder, lemon juice, and garam masala powder. Keep aside for 1 hour. Now heat 8-9 tbsp oil in the same deep frying pan. Fry the potatoes, let them turn golden brown, remove and keep aside. In the remaining oil add bay leaf, dry red chilli, and green cardamoms. Stir for a few seconds, add rest of the sliced onions, fry until light brown in color. Add the ginger-garlic paste, cumin powder, coriander powder, turmeric powder, and chopped tomatoes. Mix well and mash the tomatoes with the help of the spatula. Cook the masala over medium heat until it starts leaving the oil (1-2 minutes approx.). Add marinated chicken pieces and green chillies, mix well, cover, and cook over low heat. Uncover and keep stirring in between. When the chicken is half cooked add salt, black peppercorn powder, potatoes, and sugar. Mix, cover and cook until the chicken is fully done. 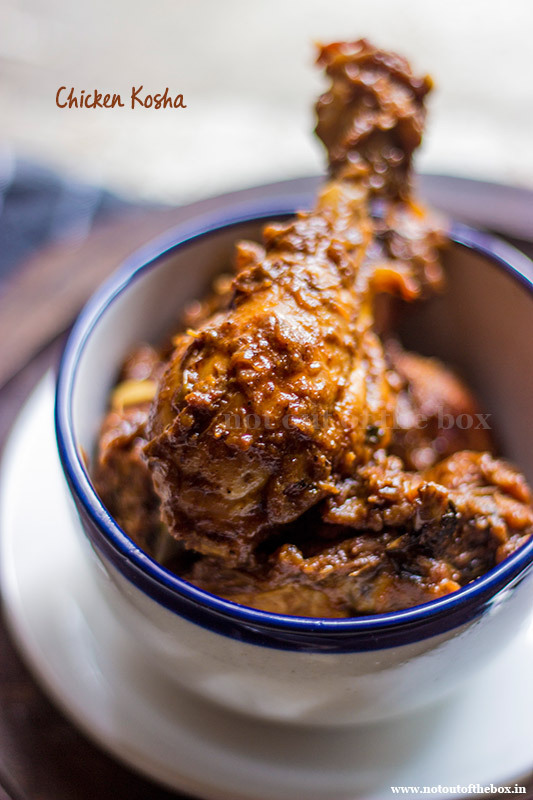 Serve hot Chicken Kosha with roti, luchi, parota, puri, pulao or fried rice whatever you like. This Chicken Curry goes well with almost every Indian style rice dishes. This Chicken Curry needs to be cooked on a little thicker side. I cook my Chicken Kosha without water. If you feel that the curry is drying up too much at the time of cooking, add 1/2 cup of hot water into this and then cook further until done. Thanks for this recipe. Was really yummy. The process was very well explained too. 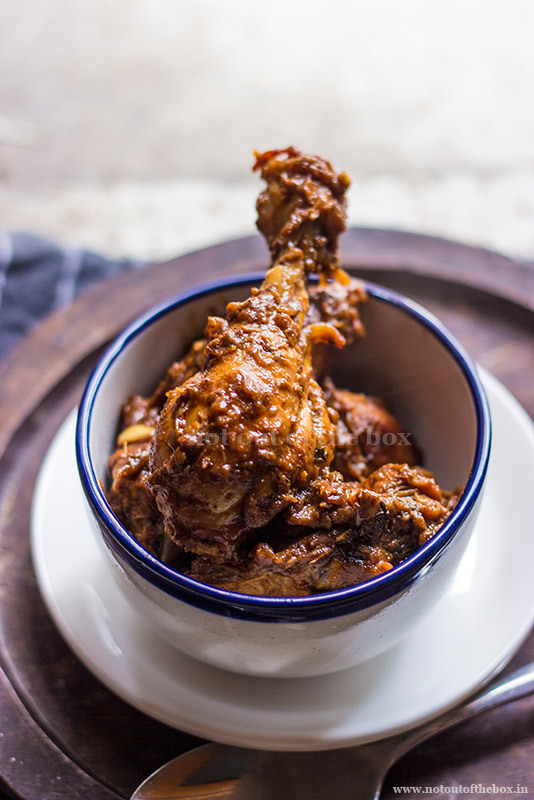 Hey… So I took a shot at this recipe coz of my new found love for Bengali cuisine. While it tasted yumm, I didn’t get the kind of colour like your pic. Any reason you think why that could be the case? Hi Priyanka, I’m happy to know that you’re loving Bengali food. :)’Koshano'(slow cooking with the spices only) is an important part of this recipe, the longer you’ll do the koshano the colour will come out. The colour would be more intense if you cook in an iron wok. Better luck next time. Happy Cooking! Do i need to add the entire marinade along with the chicken pieces? In particular I add the onion and garlic pieces when making the curry? Hello Chandrima! I am a Greek who loves Indian cooking but I have some difficulty in understanding the differences between your regions as more or less the ingredients and cookingmethods I find the same! Anyway, this is an excellent recipe, I guess the marinating process makes all the difference (fits time ever I marinated with cooked onions!) otherwise there is no real difference from a Punjabi recipe…or is there? Help! Hi Vassilis, Thank you for visiting. I hail from the eastern part of India. There are significant differences between Punjabi and Bengali recipes but as everything falls under ‘Indian food’ so, there might be some dishes which appear similar due to the usage of the ingredients in them. But the end result of the cooked dish is different in taste.